Communication through body gestures permeates our daily life. Efficient perception of the message therein reflects one’s social cognitive competency. Here we report that such competency is manifested temporally as shortened subjective duration of social interactions: motion sequences showing agents acting communicatively are perceived to be significantly shorter in duration as compared with those acting noncommunicatively. The strength of this effect is negatively correlated with one’s autistic-like tendency. Critically, intranasal oxytocin administration restores the temporal compression effect in socially less proficient individuals, whereas the administration of atosiban, a competitive antagonist of oxytocin, diminishes the effect in socially proficient individuals. These findings indicate that perceived time, rather than being a faithful representation of physical time, is highly idiosyncratic and ingrained with one’s personality trait. Moreover, they suggest that oxytocin is involved in mediating time perception of social interaction, further supporting the role of oxytocin in human social cognition. Einstein once joked: “Put your hand on a hot stove for a minute, and it seems like an hour. Sit with a pretty girl for an hour, and it seems like a minute. That’s relativity.” While it may not have helped explain the space-time continuum, his joke neatly captures how time can appear to pass at different rates. This perception depends in part on the sensory properties of the stimuli we are experiencing. Intense stimuli, such as bright and fast-moving objects, trigger stronger responses in the brain than less intense stimuli, and so we perceive them as longer lasting. But what role do we, as the experiencers, play in how we perceive time? To find out, Liu, Yuan, Chen et al. showed volunteers pairs of movie clips, each featuring two human figures outlined by dots. In one clip, the two figures interacted socially, for example by passing an object between them. In the other, the two figures moved independently of each other. The volunteers had to decide which clip lasted longer. The volunteers generally judged clips containing social interactions to be shorter than those without such interactions, even when this was not the case. Moreover, volunteers with better social skills tended to underestimate the length of the social interaction clips to a greater extent. Previous studies have shown that people who are more social tend to have higher levels of a hormone called oxytocin in their blood. Oxytocin is sometimes referred to as the ‘love hormone’ because it promotes social behavior and bonding. Applying an oxytocin nasal spray to the volunteers who were less socially proficient caused them to perceive the social interaction clips as shorter than before. By contrast, socially proficient volunteers who used a nasal spray that blocks the effects of oxytocin perceived these clips as longer than they had done previously (although they still judged the clips to be shorter than videos that did not show people interacting). The perception of time thus varies between people and may depend at least in part on personality. These results open up a new avenue for studying and manipulating how we process social situations. This could eventually benefit people who struggle with social interactions, such as those with autism spectrum disorders. As a joke, Albert Einstein once gave this picture to explain his theory of relativity: “Put your hand on a hot stove for a minute, and it seems like an hour. Sit with a pretty girl for an hour, and it seems like a minute. That's relativity.” This seemingly intuitive picture has no bearing on the structure of space-time, yet nicely illustrates the now established finding that mental time deviates, sometimes significantly, from physical time (Eagleman, 2008). To date, the deviation between our experienced time and the physical time has mostly been attributed to sensory properties of the external stimuli (Eagleman, 2008) and their context (Shi et al., 2013). It has been proposed that subjective time is ‘warped’ by the neural energy involved in representing sensory inputs (Eagleman and Pariyadath, 2009; Zhou et al., 2018). For instance, intense and/or moving stimuli are generally experienced as longer in duration (Fraisse, 1984) as they evoke stronger perceptual responses in cortical neurons (Mayo and Sommer, 2013). Little is known as to what role, if any, we the experiencers play in the time we experience. Considering our gregarious nature and the ubiquity of social interactions in daily life, we set out to probe this issue by examining time perception of social interactions and the inter-individual differences therein. An important medium of social interaction is body gestures, from which most humans efficiently extract others’ attitudes and intentions even when the gestures are portrayed by only a handful of point lights attached to the head and major joints (Johansson, 1973). Such efficacy is considered evolutionarily endowed –– Human newborns and infants exhibit a predisposition to attend to the motions of biological entities (i.e. biological motion)(Fox and McDaniel, 1982; Simion et al., 2008); and the perception of biological motion engages a specific network of distributed neural areas, particularly the superior temporal sulcus (STS) (Grossman et al., 2005; Grossman and Blake, 2002; Vaina et al., 2001) that plays an important role in social perception in both monkeys and humans (Allison et al., 2000). Meanwhile, inter-individual variation is noteworthy. People with autism characterized by impaired social interaction and communication show both a deficit of biological motion perception (Blake et al., 2003; Klin et al., 2009) and abnormalities in the STS (Zilbovicius et al., 2006). Social proficiency varies widely even among neurotypical individuals, and is manifested behaviorally as a stable personality trait (Digman, 1990). This inter-individual variance has been associated with plasma concentrations of oxytocin, a well-documented prosocial neuropeptide, as well as polymorphisms of its receptor gene OXTR (Andari et al., 2014; Donaldson and Young, 2008; Modahl et al., 1998; Parker et al., 2014; Skuse et al., 2014; Tost et al., 2010). Likely through interactions with endogenous oxytocin, intranasally administered oxytocin (Dal Monte et al., 2014; Freeman et al., 2016; Lee and Weerts, 2016; Striepens et al., 2013) is found to alter the processing of social stimuli including biological motion in manners that depend on one’s social proficiency (Bartz et al., 2011; Kéri and Benedek, 2009) as well as blood oxytocin concentration (Parker et al., 2017). There has been limited research on the perceptual processing of social interaction between biological entities, particularly as depicted in biological motion displays. Nonetheless, social interaction is far beyond the movements of individuals. In its simplest form, it involves two agents acting in a meaningful manner: one agent executes a gesture, the other recognizes it and acts accordingly. Temporally adjacent actions generally tend to be inferred as a causal sequence and hence communicative (Lagnado and Sloman, 2006). But ultimately that social ‘meaning’ is derived from the observer’s interpretations of the agents’ actions and the relationship in between, and is, to a certain degree, subjective in nature. The present study aimed to address the effect of perceived social interaction on subjective time and its relationship with one’s intrinsic social proficiency. In a series of experiments, we carefully manipulated point-light displays of acting agents to dissociate the perception of social interaction and that of biological motion. We assessed temporal perception of such displays in individuals varying in social proficiency, and critically examined the role of oxytocin in this process. Given the aforementioned relationships among social proficiency, oxytocin and neural processing of social stimuli, our hypothesis was that both social proficiency, which reflects endogenous oxytocin level, and exogenous manipulations of oxytocin level would influence the neural efficacy in processing social interactions, and thereby modulate the subjective time of perceived social interactions. As an initial step to qualify the influence of perceived social interaction on subjective duration, we selected 10 point-light displays of motion sequences from the Communicative Interaction Database (Manera et al., 2010), each portraying two agents engaging in a communicative interaction that usually involved an object (triadic interaction, see Materials and methods), and made from them an essentially physically matched set of 10 noncommunicative motion sequences by cross-pairing the agents from different interactions (see Supplementary file 1). Observers were shown two motion sequences in each trial –– one communicative, the other noncommunicative, one after the other in random order –– and were asked to report via button press which (the first or the second) appeared longer in duration (Figure 1). We kept the duration of one motion sequence fixed at 1000 ms (communicative or noncommunicative, each in 50% of trials in random order), and varied the duration of the other one from trial to trial (from 400 to 1600 ms). In different blocks, the two motion sequences were either both shown upright, or both inverted. By assessing which motion sequence observers perceived as being longer in duration, we obtained psychometric curves that depicted the probability of choosing the communicative over the noncommunicative as a function of their physical duration difference (communicative – noncommunicative). The duration difference corresponding to a probability of 50% marks the point of subjective equality (PSE), which would be around 0 if there is no influence of social interaction on time perception. Half the interquartile range of the fitted psychometric function marks difference limen, an index of one’s sensitivity in temporal perception. Schematic illustration of an exemplar trial in the duration judgment task. Twenty-four observers (12 females) performed the duration judgment task in Experiment 1. In the upright condition, the mean PSE was 69.3 ms, significantly above 0 (t23 = 5.60, p<0.001, Cohen’s d = 1.14, Figure 2A). In other words, an upright communicative motion sequence compressed subjective duration such that it needed to be 69.3 ms longer to be perceived as equal in duration to an upright noncommunicative motion sequence. In the inverted condition, by contrast, the mean PSE was significantly smaller (t23 = −5.82, p<0.001, Cohen’s d = −1.19) and not different from 0 (t23 = −1.51, p=0.15) (Figure 2A). Inversion is known to impair the perception of biological motion and thereby social interactions mediated by biological motion, yet does not affect low-level visual features (Troje and Westhoff, 2006). This result hence verified that the temporal compression effect of perceived social interactions could not be due to low-level non-biological visual features. The data from individual observers conformed with the averaged patterns. They are summarized in Figure 2D, in which each observer’s PSEs from the upright (y-axis) and the inverted (x-axis) conditions are plotted against each other and shown as a red dot. Most red dots fell above the dashed line of slope 1, although several of them were close to the dashed line; that is, the observers were largely biased towards perceiving the communicative motion sequences as shorter in duration than the noncommunicative ones when the agents were shown upright as opposed to upside down, despite that the task did not require explicit social processing. Their temporal sensitivities remained unchanged between the two conditions, as indicated by a comparison of the difference limens (t23 = 0.70, p=0.49). Perception of social interaction shortens subjective duration. (A) Proportion of responses in which observers reported a communicative motion sequence as longer in duration than a noncommunicative one, plotted as a function of the physical duration difference between the two. Data are shown for the upright (solid curve) and the inverted (dashed curve) conditions in Experiment 1. Inset shows the PSEs. A PSE of 0 indicates a consistency between subjective duration and physical duration. (B-C) Psychometric functions for Experiments 2 and 3 where a temporally delayed version (B) and a spatially swapped version (C) of the motion sequences in Experiment 1 were respectively used. In both cases, the strengths of the spatial-temporal correlations between acting agents were unaltered but the communicative intentions were disrupted. (D) The PSEs for the upright condition versus the PSEs for the inverted condition for individual observers in Experiments 1 (red dots), 2 (blue squares) and 3 (lime triangles). A slope of 1 (dashed diagonal line) represents comparable PSEs for the upright and the inverted conditions. Error bars: standard errors of the mean; ***p<0.001. The point-light trajectories of two agents acting communicatively (coordinately) could be spatially and temporally more correlated than those of two agents acting noncommunicatively (independently) (Bassili, 1976; Chartrand and Bargh, 1999). Extraction of such a spatial-temporal relationship between two upright agents, rather than the social meaning per se, could have caused the observed temporal compression effect. To address this possibility, we conducted Experiments 2 and 3, where we eliminated the social aspect of the original communicative displays while keeping the spatial-temporal pattern differences between the communicative and the noncommunicative motion sequences unchanged. In Experiment 2, this was done by inserting a temporal lag of 700 ms in between every two acting agents (upright and inverted, communicative and noncommunicative)(Manera et al., 2013). In Experiment 3, we spatially swapped the two agents in each display such that they faced in opposite directions instead of facing each other. The two experiments were otherwise identical to Experiment 1. Analyses of the results from 48 observers (24 in each of Experiments 2 and 3; 27 females) indicated that neither the temporally delayed ‘communicative’ motion sequences nor the spatially swapped ones altered temporal perception relative to their ‘noncommunicative’ counterparts (Figure 2B and C). The PSEs were not significantly different from 0 regardless of whether the motion sequences were presented upright (t23s = 1.39 and 0.34, ps = 0.18 and 0.74, for Experiments 2 and 3, respectively) or upside down (t23s = 0.01 and −0.14, ps = 0.99 and 0.89, respectively). Between the upright and the inverted conditions, there was no significant difference in PSE (t23s = −1.02 and −0.28, ps = 0.32 and 0.78, for Experiments 2 and 3, respectively) or difference limen (t23s = −0.07 and 0.84, ps = 0.95 and 0.41, respectively). We also examined individual data and plotted each observer’s PSEs from the upright and the inverted conditions against each other. As shown in Figure 2D, the values fell on both sides of the dashed line of slope 1 and were centered around the origin for both Experiments 2 (blue squares) and 3 (lime triangles). Moreover, an omnibus ANOVA of the pooled PSEs across Experiments 1 to 3 confirmed a significant interaction between the vertical orientation of the agents (upright or inverted) and experiment (Experiment 1, 2, or 3) (F2, 69 = 9.98, p<0.001, Cohen’s f = 0.54). No such interaction was found with the difference limens (F2, 69 = 0.23, p=0.80). We hence concluded that the temporal compression effect observed in Experiment 1 was absent in Experiments 2 and 3. The mere spatial-temporal correlation between the moves of two agents, without a recognizable communicative intention (disrupted by the temporal and spatial manipulations in Experiments 2 and 3), was insufficient to affect temporal perception. We further verified in a supplementary experiment (24 observers; 12 females) using Michotte-like launching and streaming events (between two objects) (Michotte et al., 1963) that the contingency between the movements of two entities, or the inference of causality, could not account for the temporal compression effect associated with the perception of social interactions (Figure 2—figure supplement 1). On the other hand, the recognition of communicative intention is unlikely to spontaneously occur in all observers. Social communicative ability has been shown to be a continuum that extends from patients with autism into the neurotypical population (Baron-Cohen, 1995; Frith, 1991; Nummenmaa et al., 2012; von dem Hagen et al., 2011). The degree of autistic traits (or lack of social proficiency), as measured by the Autism Spectrum Quotient (AQ), varies substantially even among healthy young adults. Such variance is particularly pronounced in males, who generally score higher than females on the AQ (Baron-Cohen et al., 2001). We wondered if the extent of temporal compression induced by the perception of social interactions (see Figure 2D for inter-individual differences) was a manifestation of one’s social proficiency. To this end, we recruited a larger sample of 90 male observers and carried out Experiment 4, which employed the same task as Experiment 1 except that all motion sequences were presented upright (i.e., the inverted condition that served as a control in Experiment 1 was not included). Each observer’s autistic-like tendency was also assessed with the AQ. Overall, Experiment 4 replicated the temporal compression effect observed in Experiment 1. The mean PSE was 38.5 ms, comparable to that of the male observers in Experiment 1 (45.8 ms) and significantly above 0 (t89 = 6.07, p<0.001, Cohen’s d = 0.64, Figure 3A). Critically, inspection of the individual data revealed a significant negative correlation between PSE and AQ score: those with higher AQ scores, namely stronger autistic-like tendencies and lower social proficiencies, were less biased in making duration judgments of the communicative and the noncommunicative motion sequences, and had PSEs closer to 0 (r90 = −0.40, p<0.001, Figure 3B). The median AQ score of this sample was 19, roughly corresponding to a cut-off between low and intermediate levels of autistic traits (Baron-Cohen et al., 2001). A median split of the observers by AQ score showed that the social interaction-induced temporal compression effect was evident in the low AQ group (AQ scores < 20, mean PSE = 58.9 ms, significantly above 0; t45 = 7.06, p<0.001, Cohen’s d = 1.04), yet barely reached statistical significance in the high AQ group (AQ scores ≥ 20, mean PSE = 17.1 ms, t43 = 2.00, p=0.052), with a significant group difference in PSE (t88 = 3.51, p=0.001, Cohen’s d = 0.74), but not difference limen (t88 = 0.53, p=0.60) (Figure 3C). These results, while reaffirming the influence of perceived social interactions on subjective duration, highlighted the idiosyncrasy of subjective time for social interactions, and tied it to a stable personality trait –– social proficiency. The degree of temporal compression induced by the perception of social interactions reflects one’s social proficiency. (A) Psychometric function for Experiment 4 which contained only the upright condition. Inset shows the overall PSE. (B) Across the observers, one’s PSE negatively correlated with his score on the Autism Spectrum Quotient (AQ). (C) Comparison of the PSEs for low AQ (<20) versus high AQ (≥20) observers. Error bars: standard errors of the mean; †: marginally significant, ***p≤0.001. Autistic traits have been widely associated with reduced levels of oxytocin (Clark et al., 2013; Green et al., 2001; Modahl et al., 1998; Parker et al., 2014), and can be ameliorated with intranasal oxytocin administration (Anagnostou et al., 2012; Gordon et al., 2013; Guastella et al., 2010; Watanabe et al., 2015; Yatawara et al., 2016). The link between autistic-like tendency and subjective duration of social interactions thus raises the intriguing question of whether oxytocin plays a role therein. Experiment 5 probed this question by testing if the application of oxytocin would promote the social interaction-induced temporal compression effect in socially less proficient individuals. The same task as in Experiment 4 was employed. Eighty males with AQ scores larger than or equal to 20 (range: 20–36, same cutoff value as in Experiment 4) completed the duration judgment task twice, once before and once 40 min after the nasal administration of either oxytocin (for 40 observers) or atosiban (for the other 40 observers). Atosiban is a desamino-oxytocin analogue and a competitive oxytocin receptor antagonist (Sanu and Lamont, 2010), and has been shown to be centrally available when administered intranasally (Lamont and Kam, 2008; Lundin et al., 1986). We used it as a comparison treatment and hypothesized that its influence on subjective duration of social interactions, if any, would be in the opposite direction of oxytocin. The results were consistent with our hypotheses. In those treated with oxytocin, the mean PSE significantly increased by 36.9 ms (t39 = 3.68, p=0.001, Cohen’s d = 0.58), from 13.3 ms at baseline, which was not significantly different from 0 (t39 = 1.34, p=0.19), to 50.1 ms after oxytocin administration (significantly above 0, t39 = 4.22, p<0.001, Cohen’s d = 0.66) (Figure 4A). By contrast, in those treated with atosiban, the mean PSE was not significantly different from 0 both at baseline (9.7 ms, t39 = 1.14, p=0.26) and after atosiban administration (−9.4 ms, t39 = −1.11, p=0.28), yet numerically showed a significant reduction (t39 = −2.24, p=0.031, Cohen’s d = −0.35) (Figure 4B). Between the two drug groups, there was a marked difference in the changes in PSEs pre- and post- drug administration (t78 = 4.25, p<0.001, Cohen’s d = 0.95). These effects could not be due to changes of the observers’ temporal sensitivity, as their difference limens remained unaltered before and after drug administration (t39s = 0.35 and −0.66, ps = 0.73 and 0.51, for oxytocin and atosiban, respectively). Besides, their transient mood states, as reflected by ratings on the Profile of Mood States (POMS) scale (McNair et al., 1971), were also unaffected by drug condition (drug condition ×testing session; total mood disturbance: F1, 78 = 0.18, p=0.68; all subscales: ps > 0.1). Oxytocin mediates temporal perception of social interactions. (A-D) Psychometric functions for Experiments 5 and 6 where high AQ observers (A-B) and low AQ observers (C-D) completed the duration judgment task of upright motion sequences both before (light gray curves) and after the nasal administration of oxytocin (red curve in A), atosiban (blue curves in B and C) or saline (dark gray curve in D). Insets show the PSEs. (E) The PSEs after drug administration versus those before drug administration for high AQ individuals treated with oxytocin (light brown dots with red circles), high AQ individuals treated with atosiban (light brown dots with blue circles), low AQ individuals treated with atosiban (dark brown dots with blue circles) and low AQ individuals treated with saline (dark brown dots with gray circles). A slope of 1 (dashed diagonal line) represents comparable PSEs before and after drug administration. (F) Bivariate distributions of 1000 bootstrapped sample means for each group. Error bars: standard errors of the mean; *p<0.05, ***p≤0.001. Nonetheless, there is a reason to suspect that the influence of atosiban on socially less proficient individuals, as observed in Experiment 5, was unreliable –– they were not significantly biased by the social aspect of interactions in making duration judgments to begin with. To further verify if antagonizing the effect of oxytocin would diminish the temporal compression effect of perceived social interactions, we turned to socially proficient individuals. In Experiment 6, 80 males with AQ scores less than 20 (range: 10–19, same cutoff value as in Experiment 4) completed the duration judgment task both before and 40 min after the nasal administration of either atosiban (for 40 observers) or saline (for the other 40 observers), following the same procedure as in Experiment 5. Saline served as a placebo control here to address potential confounds including practice and fatigue. 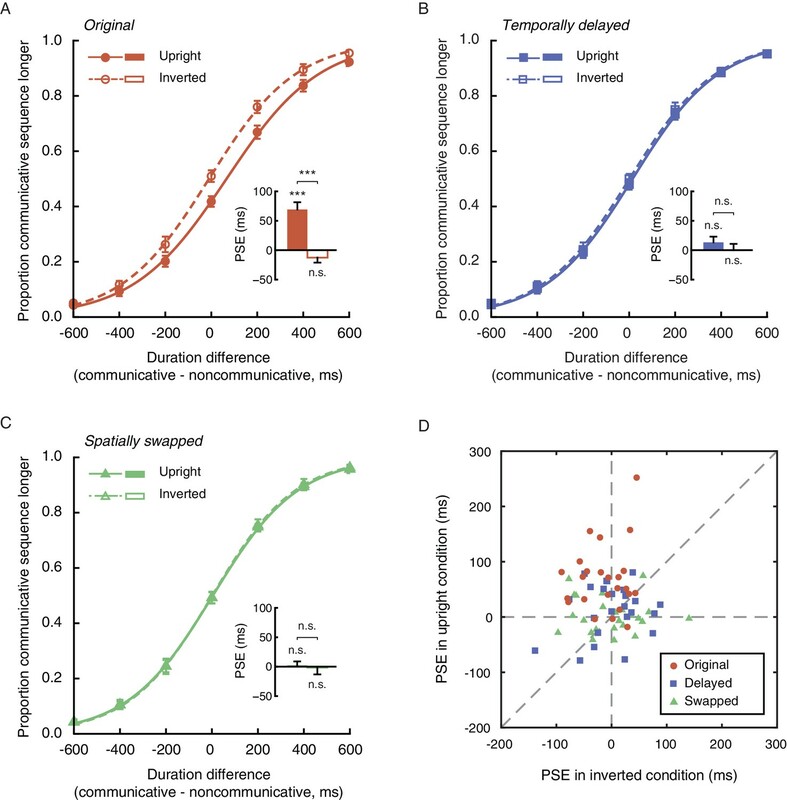 At baseline, the observers in both drug groups were significantly biased towards perceiving the communicative motion sequences as shorter in duration than the noncommunicative ones (mean PSEs = 48.6 ms and 54.5 ms, t39s = 4.32 and 5.94, ps < 0.001, Cohen’s ds = 0.68 and 0.94, for atosiban and saline, respectively), with no difference in between (t78 = 0.41, p=0.68) (Figure 4C–D). After drug treatments, however, a significant group difference emerged (mean PSEs = 17.5 ms and 46.8 ms, t78 = 2.64, p=0.010, Cohen’s d = 0.59). In those treated with atosiban, the mean PSE dropped significantly by 31.1 ms (t39 = −3.90, p<0.001, Cohen’s d = −0.62), albeit still significantly above 0 (t39 = 2.04, p=0.048, Cohen’s d = 0.32) (Figure 4C). By contrast, in those treated with saline, the PSEs were unaffected (t39 = −1.13, p=0.26; Figure 4D). There was a significant difference between the two drug groups in the changes in PSEs pre- and post- drug administration (t78 = 2.22, p=0.029, Cohen’s d = 0.50). Meanwhile, the difference limens in both groups remained unchanged (t39s = −1.07 and −1.11, ps = 0.29 and 0.27, for atosiban and saline, respectively), and the POMS ratings were unaffected by drug condition (drug condition ×testing session; total mood disturbance: F1, 78 = 0.47, p=0.50; all subscales: ps > 0.2). We plotted in Figure 4E the distributions of PSEs for individual observers in Experiments 5 and 6 before (x-axis) and after (y-axis) drug treatment. Their central tendencies are respectively highlighted in Figure 4F, generated by using a standard bootstrapping procedure (Davison and Hinkley, 1997). The majority of the observers with a high AQ score that were treated with oxytocin (light brown dots with red circles) fell around the dashed line of x = 0 on the positive side and above the dashed line of slope 1. In other words, they were not significantly biased in making duration judgments of communicative and noncommunicative motion sequences before oxytocin administration but became biased towards perceiving the communicative ones as shorter in duration afterwards, and showed increased PSEs. By contrast, the observers with a low AQ score that were treated with atosiban (dark brown dots with blue circles) mainly fell on the positive side of the dashed line of y = 0 and somewhat above it, but below the dashed line of slope 1. Those with a high AQ score that were treated with atosiban (light brown dots with blue circles) largely fell around the origin and a bit below the dashed line of slope 1. There was not much overlap between the observers treated with oxytocin (dots with red circles) and those treated with atosiban (dots with blue circles). Roughly in between lay the observers treated with saline (low AQ individuals, dark brown dots with gray circles), who mainly fell around the dashed line of slope 1 in the first quadrant of the x-y plane. As one of many social species, humans seek out companionship and social interactions. The current study demonstrates that such a motive is weaved in our mental representation of time: Motion sequences depicting agents engaging in social interactions tend to be perceived as shorter in duration than those showing agents acting noncommunicatively. This temporal compression effect is independent of the basic visual features or the non-biological properties of the agents (Experiment 1), or the spatial-temporal correlations in between (Experiments 2 and 3), and cannot be explained by the inference of causality or the contingency between two entities’ movements (Supplementary Experiment). Rather, it relies on the observer’s intrinsic autistic-like tendency, such that socially less proficient individuals are less susceptible to the effect than socially proficient ones (Experiment 4). The mechanism underlying this phenomenon critically involves oxytocin. In socially less proficient individuals that overall have lower levels of endogenous oxytocin (Andari et al., 2014; Modahl et al., 1998; Parker et al., 2014), oxytocin administration promotes the social interaction induced temporal compression effect (Experiment 5). By contrast, in socially proficient individuals with overall higher levels of endogenous oxytocin, the very effect is diminished following the application of an oxytocin antagonist named atosiban (Experiment 6). Whereas distortion of time perception has been widely associated with properties of the stimuli (Eagleman, 2008) and the context (Shi et al., 2013), these findings provide, to our best knowledge, the first empirical evidence that links the subjective time of an event with a personality trait, namely social proficiency. In doing so, they open up a new avenue to probe automatic processing of complex social interplays at the individual level. Social perception involves multifaceted information processing that culminates in the accurate recognition of others’ dispositions and intensions. It inherently entails the integration of information, including the integration between origin and effect (causal integration), the integration of clues (e.g. motion cues) to form impressions, extract intentions, and arrive at judgments (cognitive algebra), etc (Anderson, 1981; Blythe et al., 1999; Heider, 1944; Smith, 1984). Autism spectrum disorders have been associated with deficits in sensory integration (Brandwein et al., 2013; Gepner and Mestre, 2002), though not with unisensory temporal function per se (Stevenson et al., 2014). It is plausible that such deficits cascade into the domain of social interactions and partially cause the aforementioned effects. Multiple brain regions are engaged in social perception, and coordinately enable efficient assessment and interpretation of social signals. They include not only the STS that supports the understanding of actions (Allison et al., 2000), but also higher cortical areas like the temporal-parietal junction (TPJ) that represents mental states (Carter and Huettel, 2013) and the dorsal medial prefrontal cortex (dmPFC) that is implicated in the uniquely human representation of triadic interactions between two minds and an object (Saxe, 2006). The observed temporal compression effect, being independent of the perception of biological motion, likely arises from these higher stages of social processing (Cusack et al., 2015; von der Lühe et al., 2016). Subjective time has been proposed to be a signature of the amount of energy expended in representing a stimulus (Eagleman and Pariyadath, 2009). It is plausible that communicative motion sequences are processed with increased efficiency in TPJ and dmPFC relative to motion sequences without a recognizable communicative intention, thus leading to lowered metabolic cost (Gutnisky and Dragoi, 2008; Laughlin, 2001) and shortened subjective duration, particularly in socially proficient individuals. Of note here is that this temporal compression effect can hardly be accounted for by the operation of a dedicated neural module specialized for representing the temporal relationships between events (Ivry and Schlerf, 2008), since it is specific to the perception of social interactions. Oxytocin partially drives social motivation (Dölen et al., 2013) and has increasingly been identified as an important modulator of social behaviors (Carter, 2014; Donaldson and Young, 2008) ranging from social recognition (Oettl et al., 2016) to consolation (Burkett et al., 2016) and ethnocentrism (De Dreu et al., 2011). It has also been linked to repetitive behaviors –– a core feature of autism (Hollander et al., 2003; Insel et al., 1999). Results from human brain imaging studies indicate that the application of oxytocin modulates responses in the STS, TPJ and the prefrontal cortex, among others, in various social cognitive tasks (Zink and Meyer-Lindenberg, 2012). Such alterations of neural activities presumably facilitate social processing in socially less proficient individuals, where exogenous oxytocin has been shown to exert a more definitive prosocial effect (Bartz et al., 2010; Bartz et al., 2011), thereby giving rise to their shortened subjective duration of social interactions following oxytocin administration. In socially proficient individuals, the influence of exogenous oxytocin is more complicated, even hard to predict and interpret (Bartz, 2016; Bartz et al., 2010; Bartz et al., 2011; Olff et al., 2013). 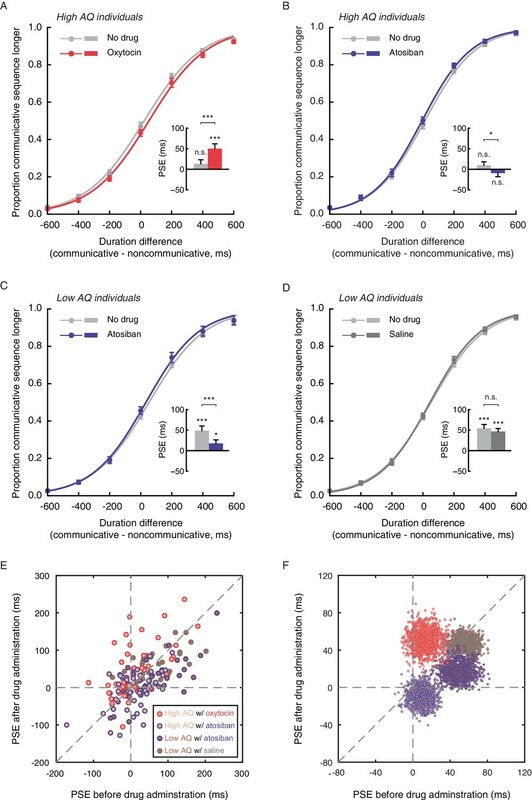 Nevertheless, we were able to show that antagonizing the effect of endogenous oxytocin with atosiban in this group of observers reduced the temporal compression effect as compared to a placebo control. The comparison between oxytocin and atosiban spoke directly to the role of oxytocin in mediating time perception of social interactions. This finding also adds to and extends the extant pharmacological research on time perception, which has primarily focused on dopamine, serotonin and acetylcholine (Allman and Meck, 2012; Meck, 1998). We conclude that the perceived duration of social interactions is a product of complex neuroendocrine and neural processes, the exact mechanism awaiting further investigation, and is ingrained with one’s social traits. Subjective time is not only nonuniform, like Einstein alluded to in his analogy, but also idiosyncratic. Seventy-two young adults (39 females; mean age ± SD = 22.8 ± 2.5 years) participated in Experiments 1 to 3, 24 in each experiment. Sample sizes were determined by G*Power to be sufficient to detect a large temporal distortion effect in time perception (d ≥ 0.8), at a power larger than 95%. The effect size was estimated based on an earlier study that employed biological motion stimuli and similar psychophysical testing procedures to those in the current study (Wang and Jiang, 2012). An independent group of 90 males (22.5 ± 2.7 years) took part in Experiment 4. In addition, 80 male non-smokers (22.1 ± 2.6 years) who scored above or equal to 20 on the Autism Spectrum Quotient (AQ) (mean AQ score ±SD = 24.9±4.3) participated in Experiment 5. Another 80 male non-smokers (22.8 ± 2.3 years) with AQ scores below 20 (15.5 ± 2.7) participated in Experiment 6. Only males were recruited in Experiments 4–6 for the following reasons: In Experiment 4, this was done to take advantage of men’s pronounced variance in social proficiency (Baron-Cohen et al., 2001). In Experiments 5 and 6, this was due to pragmatic reasons (like most intranasal oxytocin studies), as oxytocin and atosiban respectively cause and antagonize contractions of the uterus. All participants reported to have normal or corrected-to-normal vision. Those in Experiments 5 and 6 also reported to have no respiratory allergy or upper respiratory infection at the time of testing. They gave informed consent to participate in procedures approved by the Institutional Review Board at Institute of Psychology, Chinese Academy of Sciences. Ten communicative point-light motion sequences (C1-10 in Supplementary file 1), each portraying two agents of the same gender engaging in either a face-to-face (dyadic, two motion sequences) or a person-object-person (triadic, eight motion sequences) interaction, were chosen from the Communicative Interaction Database (Manera et al., 2010). By cross-pairing the agents of the same gender from different interactions, we produced an essentially physically matched set of 10 noncommunicative motion sequences (NC1-10 in Supplementary file 1). We verified in an independent group of 24 observers (half male, 27.5 ± 3.3 years) that the noncommunicative motion sequences were perceived as significantly less communicative than the communicative ones (normalized communicativeness rating: 0.37 vs. 0.71, t23 = −8.11, p<0.0001, Cohen’s d = −1.66). These twenty motion sequences and their inverted (upside-down) counterparts were used in Experiment 1, shown at 30 frames per second with a visual angle of approximately 6°×9° (each agent was approximately 2°×9°). In Experiments 2 and 3, a temporally delayed version and a spatially swapped version of the stimuli in Experiment 1 were respectively adopted. Specifically, we introduced a temporal lag of 700 ms (21 frames) in between every two acting agents (communicative and noncommunicative, upright and inverted) in Experiment 2 (Manera et al., 2013), and spatially swapped the two agents in each display in Experiment 3 such that they faced in opposite directions instead of facing each other. The original upright communicative and noncommunicative motion sequences were employed in Experiments 4–6. Each trial of the duration judgment task in Experiment 1 began with a fixation on a central cross (1°×1°) for 1000 ms, followed by two sequentially presented motion sequences –– one communicative, the other noncommunicative, in random order with a blank screen of 400–600 ms in between (Figure 1). One of the motion sequences (communicative or noncommunicative, each in half of the trials in random order) was presented for 1000 ms, the other for 400, 600, 800, 1000, 1200, 1400 or 1600 ms with equal possibility. That is, the duration difference between the communicative and the noncommunicative motion sequences ranged from −600 ms to 600 ms in steps of 200 ms. Observers were asked to press one of two buttons to indicate which motion sequence (the first or the second) was longer in duration, a task that did not require recognitions of the nature of the motion sequences. The next trial began immediately after a response was made. There were 35 trials in each block and a total of 8 blocks. In half of the blocks, the motion sequences were presented upright; in the other half, they were presented upside down. The order of the ‘upright’ and the ‘inverted’ blocks was balanced across observers. There was a short break of 1 to 2 min in between the blocks. Experiments 2 to 6 followed the same procedures as in Experiment 1 except for the followings: In Experiments 2 and 3, a temporally delayed version and a spatially swapped version of the visual stimuli were respectively used (see Visual stimuli above). As a result of the temporal lag inserted between the acting agents, each motion sequence in Experiment 2 was presented for 700 ms longer than in Experiment 1 on average. In Experiment 4, observers only completed 4 ‘upright’ blocks. In Experiments 5 and 6, observers completed 4 ‘upright’ blocks at baseline and another 4 ‘upright’ blocks 40 min after drug treatment (see Drug Application below). They also provided ratings on the Profile of Mood States scale (McNair et al., 1971) following the duration judgment task both at baseline and after drug treatment. Observers in Experiments 5 and 6 self-administered a single intranasal dose of 24 IU of oxytocin (ProSpec,>99.0% as determined by RP-HPLC, dissolved in saline; three puffs per nostril, each with 4 IU of oxytocin; for half of the observers in Experiment 5), 60 µg of atosiban (ProSpec,>99.0% as determined by RP-HPLC, dissolved in saline; three puffs per nostril, each with 10 µg of atosiban; for half of the observers in Experiments 5 and 6) or saline (three puffs per nostril, for half of the observers in Experiment 6), in a randomized between-subjects manner, after they completed the baseline blocks of the duration judgment task and the Profile of Mood States scale. Neither the participants nor the experimenters were aware of the identity of the drug used. Atosiban is a desamino-oxytocin analogue and a competitive oxytocin receptor antagonist (Sanu and Lamont, 2010). Both oxytocin (Dal Monte et al., 2014; Freeman et al., 2016; Lee and Weerts, 2016; Striepens et al., 2013) and atosiban (Lamont and Kam, 2008; Lundin et al., 1986) have been shown to be bioavailable when administered intranasally. Fresh oxytocin and atosiban solutions were made every 3 days during the period of data collection, such that for each participant in the drug administration experiments, the solution he received was prepared in less than 3 days before. The prepared solutions were stored in 10 ml sterilized nasal spray bottles at 4°C until usage. For each observer under each condition, we calculated the proportions that a communicative motion sequence was judged as longer in duration than a noncommunicative one, and fitted them with a Boltzmann sigmoid function f(x)=1/(1+exp((x−x0)/ω)), where x corresponds to the physical duration difference between a communicative motion sequence and a noncommunicative one (-600 ms, -400 ms, -200 ms, 0 ms, 200 ms, 400 ms, or 600 ms), x0 corresponds to the point of subjective equality (PSE), at which the observer perceived a communicative motion sequence as equal in duration to a noncommunicative one; and half the interquartile range of the fitted function corresponds to difference limen, an index of temporal discrimination sensitivity. PSE and difference limen served as the dependent variables and were subsequently compared between conditions and groups. Trends in Cognitive Sciences 4:267–278. Journal of Autism and Developmental Disorders 31:5–17. Trends in Cognitive Sciences 15:301–309. Current Directions in Psychological Science 25:104–110. Journal of Personality and Social Psychology 33:680–685. How motion reveals intention: Categorizing social interactions, Simple Heuristics That Make Us Smart, New York, Oxford University Press. Trends in Cognitive Sciences 17:328–336. Journal of Personality and Social Psychology 76:893–910. Annual Review of Psychology 41:417–440. Is subjective duration a signature of coding efficiency? Philosophical Transactions of the Royal Society B: Biological Sciences 364:1841–1851. Current Opinion in Neurobiology 18:131–136. Annual Review of Psychology 35:1–37. Trends in Cognitive Sciences 6:455. Oxytocin, vasopressin, and autism: is there a connection? Trends in Cognitive Sciences 12:273–280. Cognitive, Affective, & Behavioral Neuroscience 9:237–241. Journal of Experimental Psychology: Learning, Memory, and Cognition 32:451–460. Expert Review of Obstetrics & Gynecology 3:163–174. Current Opinion in Neurobiology 11:475–480. European Journal of Endocrinology 112:465–472. San Francisco: Educational and Industrial Testing Service. Miles T, Miles E, editors. New York: Basic Books. Therapeutics and Clinical Risk Management 6:191–199. Current Opinion in Neurobiology 16:235–239. Trends in Cognitive Sciences 17:556–564. The Journal of Neuroscience 34:691–697. The inversion effect in biological motion perception: evidence for a "life detector"? Philosophical Transactions of the Royal Society B: Biological Sciences 371:20150373. Thank you for submitting your work entitled "Perception of social interaction idiosyncratically compresses subjective duration in an oxytocin-dependent manner" for consideration by eLife. Your article has been reviewed by three peer reviewers, and the evaluation has been overseen by a Guest Reviewing Editor and a Senior Editor. The following individuals involved in review of your submission have agreed to reveal their identity: Jennifer Bartz (Reviewer #2). The good news is that all the reviewers found the work interesting if not downright fascinating and lauded the use of diverse methods. The results certainly are intriguing and thought provoking. The less good news is that the studies lack the power to be confident that the effects observed are, in fact, robust, and the manuscript would be significantly strengthened by substantially bolstering the sample sizes across the board. On the one hand, the fact that core effects replicate across different samples of participants, however small, is important. On the other hand, sample sizes of n = 12 per group in nearly all reported studies, especially given the apparently modest effect sizes reported, are not large enough to be confident in the present results. Although one reviewer was willing to overlook this for the drug administration studies, which they recognize as difficult to run with samples of any size, the fact that sample sizes were small across the board – combined with some of the concerns highlighted below – means that in its present form the paper is not appropriate for consideration for publication in eLife. Beyond this core concern, there are a number of issues raised by the reviewers that concern the lack of a single clear interpretation for the findings – and possible alternatives not considered in the paper – as well as the value of control conditions that are not present in the reported studies. For example, one important issue concerns the lack of placebo control for the OXT data. While the DV used here is arguably less susceptible to the kind of expectancy effects that can plague other DVs used in the social cognition and oxytocin literatures, including a placebo group is standard procedure in oxytocin administration studies. The atosiban group is useful here to show that the effects of drug administration differ as a function of the drug, but it would still be useful to have the placebo group as a control to determine the extent to which expectancies impact the observed results. The authors could address this limitation in the discussion. Also important is the point raised by reviewer #1 concerning the spatial and temporal disruptions in the control stimuli, which impact not only the perception of communicative intentions but may also change the basic perceptual complexity of the task, taxing participants' ability to integrate disparate perceptual signals. As this reviewer notes, a difference in complexity and need to integrate complex cues may crosscut social vs. nonsocial comparisons, and it could be valuable to include a control condition in which a participant interacts contingently with a non-social object (with a parallel disruption of perceptual cues). Given deficits in temporal integration of events over time shown by individuals with ASD (see reference cited by this reviewer), this would help determine whether the present data derive from something social per se as opposed to the ability to form a cohesive and integrated representation of events. Along these lines, I would highlight the concerns that reviewer #2 raises concerning other possible factors that could mediate the effects of oxytocin. For example, oxytocin has been implicated in obsessive/repetitive/stereotyped behaviors (e.g., Leckman et al., 1994; McDougal et al., 1999; Insel et al., 1999; Hollander et al., 2003) as well as anxiety, which is one of the reasons some have hypothesized that oxytocin may be dysregulated in autism, given that both oxytocin and autism have been linked with repetitive behaviors/rigidity and social impairments. It is possible that the effects of oxytocin observed here could be mediated by these other processes, which should be raised in the discussion. The bottom line is that bolstering sample sizes and addressing the concerns raised by the reviewers would substantially strengthen the manuscript should you submit it for publication in another venue. The authors connect an impressively varied subject matter from biological motion, perception of time, autism, and oxytocin to support a very interesting hypothesis about temporal compression in perception. My primary concern is the small sample sizes which constrain confidence in the results. For this reason alone, I cannot recommend publication in eLife. I sincerely hope that the authors consider collecting a new, larger set of data, ideally after pre-registering the hypotheses and methods. I think the ideas and experimental designs are sufficiently interesting and innovative to make a strong contribution to the literature assuming well-powered empirical support. 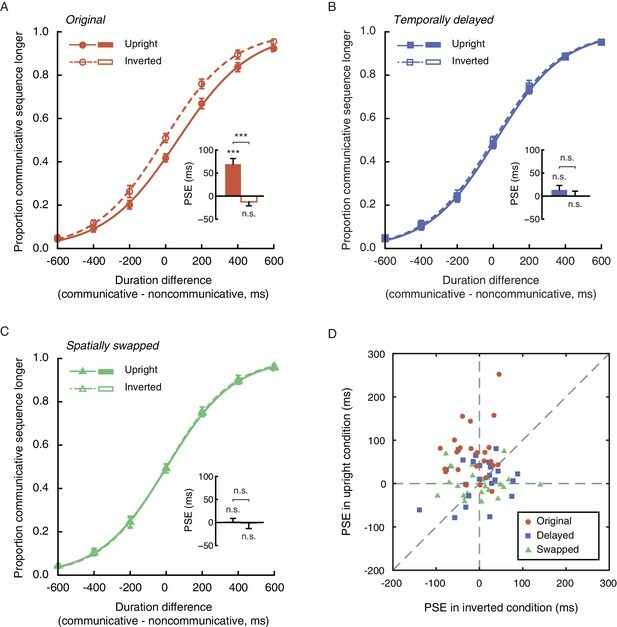 The spatial and temporal disruptions in the control stimuli not only disrupt the perception of communicative intentions but presumably also add a measure of perceptual complexity (e.g., a lack of integration of signals reduces the ability of subjects to engage in higher-order data reduction). This difference in complexity is not just about social vs. nonsocial; indeed, one can imagine doing the same to nonsocial displays in which a person is interacting contingently with another object. This is important because people with autism exhibit deficits in temporal integration of events over time more generally and so it is unclear which piece is critical here -- is it the social piece or is it the ability to form a cohesive integration of events (whether social or nonsocial)? See Stevenson et al., 2014 as an example of this more general deficit in people with ASD. In this research, the authors studied the phenomenon in which the subjective perception of time is compressed when humans process social information-they argue that this "relativity" in time perception reflects the ease associated with human social cognition. To this end, they show that individual variation in social proficiency (as measured by the Autism Quotient) correlates with subjective time perception, with lower (vs. higher) AQ scorers reporting shorter durations for socially communicative (vs. non-communicative) motion sequences. Moreover, they show that oxytocin, a neurohormone implicated in social affiliation and social cognition, appears to regulate this phenomenon. Specifically, administration of an oxytocin agonist facilitated time compression for less socially proficient individuals, whereas administration of an oxytocin antagonist (atosiban), produced the opposite effect-rendering the experience of time even longer for the socially communicative motion sequences. Finally, in experiment 6, atosiban administration made more socially proficient individuals "look like" less socially proficient individuals in that it lengthened their subjective experience of time when processing social information. I think this is a fascinating series of studies that has the potential to make a significant contribution to our understanding of human social cognition. I particularly like the diversity of approaches that the authors used to test their hypotheses. This is also the only study I know of that has used both an oxytocin agonist and antagonist to establish the causal role of oxytocin in human social information processing. Below are questions and comments that arose as I was reviewing this work; since my expertise is in the field of oxytocin, I have focused most of my comments on that aspect of the research. As noted, I really like the diverse methodological approaches the authors used, and I think that this speaks to the robustness of the phenomenon in question. That having been said, the sample size for the drug administration studies was small, even considering the within-subject design used. Given increased concerns about replication in science, I wondered if the authors could speak to the robustness of the effects. Of course, one option is to collect more data; that said, I appreciate the difficulty and expense of this kind of research. As an alternative, perhaps the authors could use bootstrapping to obtain an estimate of the confidence intervals for the effects observed? In the absence of additional data, it would be reassuring to know that the estimated effect(s) ranged from, say, p=0.01 to p=0.12, and not p=0.01 to p=0.4. I had a few questions about the oxytocin agonist and antagonist used in this research. First, is "ProSpec" the drug manufacturer? I am not familiar with ProSpec and wondered if the authors could provide some additional information about ProSpec vis a vis quality control. Second, I was not able to access the paper by Lundin et al. showing that atosiban can be administered nasally and, for this reason, thought it might be helpful if the authors could provide more details about Lundin et al's findings regarding the bioavailability of nasally administered atosiban in their paper. Third, it would be helpful if the authors could give more information about the preparation of the atosiban-is this a commercially available product, or was it made by the researchers? What was the concentration of the active ingredient? Do intranasal and IV formulations of atosiban differ and is this relevant for the present investigation? In Experiments 5 and 6, the researchers preselected participants based on an AQ cutoff of > 20; how was this cutoff determined? I believe the "autism cutoff" on the AQ-adult is 32 (Baron-Cohen et al., 2001). I realize the researchers are not making the claim that their sample is actually on the autism spectrum and, therefore, would not need to use such a rigorous cutoff, but I'm just curious how they selected their cutoff. The authors might consider spending some time discussing the meaning of the time compression effect in the introduction-that is, why it comes about and what it means. They address this in the discussion (i.e., that it likely reflects "the amount of energy expended in representing a stimulus") but, given the novelty of the phenomena, I think it would be helpful to readers to discuss this a bit in the introduction as well. This manuscript describes a series of carefully conducted, highly innovative experiments which provide important new information on how social proficiency and oxytocin signaling affect the temporal perception of social interactions in humans. These findings are carefully presented and interpreted and include the following: (1) there is shortened subjective perception of time duration for more socially interactive motion sequences; (2) autistic traits (as measured by the gold-standard AQ) influence subjective social perception, with high AQ individuals failing to show the temporal compression effect; and (3) pharmacological manipulation of the oxytocin system alters temporal compression effects, with oxytocin administration restoring, and an oxytocin antagonist diminishing, this effect in high AQ and low AQ individuals, respectively. The statistical analyses appear appropriate and the methods (with a few minor exceptions) are clearly described. This research study will be of high interest to the broad readership of eLife. 1) The lack of a placebo control is problematic. This should be addressed as a study limitation in the Discussion section. 2) The authors in multiple places indicate that endogenous oxytocin levels are associated with measures of social functioning, but they themselves do not test this in their research paradigm. (See also #3 below.) It would be an additional strength of this paper if blood or salivary samples were available and oxytocin levels quantified and analyzed in the context of this report. Are such samples available? 3) Impact statement: The authors did not assess endogenous oxytocin levels, so it is speculative to conclude that these personality traits have neuroendocrine origins. 4) Introduction: I have no idea what this sentence means: "likely through interactions with endogenous oxytocin, intranasally administered oxytocin (Born et al., 2002), is found to alter the processing of.…". Moreover, to my knowledge, there are no studies which have mechanistically evaluated endogenous oxytocin biology in the context of oxytocin administration (in humans or animals) and the Born et al., paper 2002 does not examine oxytocin (but instead vasopressin). I suggest rewriting this sentence for clarity and citing a more accurate reference. 5) Discussion section: "nevertheless, we were able to show that antagonizing endogenous oxytocin" – not technically true; the authors in fact antagonized OXTR. 6) Materials and methods section (subjects): what was the overlap in subjects tested across experiments? Were any repeatedly exposed to the same test stimuli? If so, how did this affect results/was guarded against? 7) Materials and methods section (drug application): What was the latency from drug (agonist and antagonist) administration to behavioral testing? How was the dose of atosiban determined? Were preliminary dose-response studies conducted to determine drug efficacy? Thank you for submitting your article "Perception of social interaction compresses subjective duration in an oxytocin-dependent manner" for consideration by eLife. Your article has been reviewed by three peer reviewers, and the evaluation has been overseen by a Reviewing Editor and Sabine Kastner as the Senior Editor. The following individuals involved in review of your submission have agreed to reveal their identity: Sylvia Morelli (Reviewer #2); Carolyn Parkinson (Reviewer #3). As you recall, in the prior submission there were a number of points raised by reviewers with issues of the sample sizes in the studies and the lack of a placebo group in the drug administration studies being among the most significant. We agreed to review this revised manuscript in large part because – in addition to attempting to address the rhetorical and stylistic issues raised in the prior round of reviews – the sample sizes were increased for all studies and the core effects remained significant. With this in mind I was able to secure three reviews for this version of the paper – one from a reviewer of the initial submission (reviewer 1) and two new reviewers. All are experts in the field. As a group, the reviewers and I all have enthusiasm for the paper's attempt to study an aspect of social perception that is often overlooked – namely, its temporal component. Furthermore, the studies examining the way in which oxytocin impacts such perception, are of great interest. However, there remain significant questions about the sample size and placebo issues raised in the first round of reviews, and as can be the case when new reviewers bring their fresh perspectives to a manuscript, new and I believe important questions about the nature of the results have been raised. As I believe all comments made by the reviewers are important to address, the individual reviews are appended below. 1) The lack of placebo group, especially in Experiment 6. While you argue that expectancy effects are likely not the cause of the observed results in Experiment 5, It would be useful to add discussion of why issues related to the lack of a placebo control group (beyond expectancy effects), such as practice effects or fatigue, would or would not impact the results in Studies 5 and 6. While we believe that this is less likely to be an issue for Experiment 5, given that half of the high AQ participants were given oxytocin and half were given atosiban, and the results were in opposite directions across groups (i.e., an increase in the PSE in the oxytocin group and a decrease in the atosiban group), it would be more compelling to report whether the changes in PSEs pre- and post-drug administration differed significantly between groups by comparing them directly. An additional question about Study 5 was whether the drugs were administered in a double-blind fashion. I wasn't sure if there was reference to this in the manuscript. Of course, it would be highly problematic if administration was not double blind. The lack of a placebo-matched control group in Experiment 6 we see as much as more problematic, however, because there is only an atosiban-administration group for the low AQ sample (and no comparable, low AQ group that was administered oxytocin). As such, it is difficult to determine whether the decreased temporal compression effect observed there is due to, for example, practice effects, or to the effects of atosiban administration. Adding in a matched (low AQ) control group that receives a placebo or oxytocin would clarify how to interpret the results of Experiment 6. Indeed, we think this is absolutely critical. A pre-post design with no experimental manipulation does not meet the standards of at a top-tier journal such as eLife. We recognize that it's hard to say whether it is feasible to collect such data in two months because addressing this involves more than just running placebo participants – it also means running additional drug participants to ensure random assignment and maintain the double-blind nature of the study. 2) There continue to be questions about sample sizes. Even at their larger sizes (compared to the first submission), the new reviewers were concerned that they were small. All of us felt that power analyses are necessary to justify the current sample sizes. That said, I concur with the first reviewer that the sample sizes for the drug studies are smaller than is the current norm. As this reviewer notes, the effects of oxytocin (and possibly atosiban) can be person-dependent and as such small samples are discouraged to ensure that observed effects are not driven factors that are not of interest, including idiosyncrasies in the way some people respond to oxytocin that may drive effects when sample sizes are small but cancel out when samples are sufficiently large. This reviewer – who is an expert on the administration of intranasal oxytocin – notes that currently studies typically have at least 40-50 participants per cell for between-subject designs and 30 ps for within-subject designs. By contrast, the current Experiments 5 and 6 have much smaller sample sizes per cell. As such, it would be advisable that any new data collected to address the placebo issue include larger samples that honor currently accepted norms. 3) Reviewer 3 raises an important issue concerning the need for a non-social control condition. This reviewer notes that the present Experiments lack non-social control stimuli that use motion displays that control for non-social aspects of motion – e.g. stimuli depicting the interactive, contingent movement of multiple entities/objects (e.g., a person interacting with a tool or object; Michotte-like ball launching stimuli; a stream of dominos falling). There is an important question about whether such displays would be judged to be of shorter duration than comparable displays depicting the same entities moving entirely independently from one another. A revision would need to address this issue as well. Given the lingering concerns, it would help us to know if you could address the key issues above in a comprehensive and timely manner. Please address your responses in a letter that the reviewers could consider in order to offer additional advice. We are particularly concerned about the time it may take to establish and evaluate a placebo group. Finally, let me thank you again for submitting this manuscript. We hope you are able to revise it in accord with the above summary – and the more detailed comments of the reviewers below. I reviewed this paper when it was first submitted to eLife. I found the research to be novel and highly interesting. The major criticism with the initial paper was that the sample size for each of the 6 studies was small. The authors have now increased the sample size for all 6 studies, and the effects originally reported hold. Reproducibility is a concern in psychology and other sciences right now and I commend the authors for addressing this in their work-as we're learning, replication, especially when it involves multiple studies, is not always easy (e.g., OSF, Science, 2015). I was curious how the authors decided what an appropriate sample size would be for each study-was a power analysis conducted? If so, that should be reported. I appreciate the authors' point that establishing the time compression effect does not require a large number of participants because, as they note in response to reviewer 1 – point 1, each participant has a very large number of data points. However, studies 4, 5, and 6 still seem a bit small to me. It is known that the effects of oxytocin (and possibly atosiban) can be person-dependent and, for this reason, small samples are discouraged as the effects could be driven by, e.g., idiosyncrasies in the way some people respond to oxytocin. My impression is that most intranasal oxytocin studies that are published now have at least 40-50 ps/cell for between-subject designs and 30 ps for within-subject designs; with 12 and 24 participants, studies 5 and 6 still seem small to me. Of course, if a power analysis suggests otherwise that would be useful information to know. (Also, the effects are consistent with other work on oxytocin and social cognition so reassuring on that front). The sample size of study 4 also seems a bit small for evaluating the correlation between two variables (e.g., see Lindsay, 2015)-I don't think the authors need a sample as large as 250 (cf. Schönbrodt and Perugini, 2013), since the effect is consistent with prior work linking AQ with indices of social cognitive proficiency, but some justification for the sample size seems necessary given current norms. In the previous round of reviews concerns were raised about the lack of a placebo control. The authors acknowledged this limitation but argue that expectancy effects were unlikely with the task they used. I agree but note that expectancy effects are not the only reason why a placebo control is useful; other reasons to have a placebo control are to address such confounds as practice effects or fatigue. Is it possible that either of these factors could be driving the effects in studies 5 and/or 6? Across several experiments, the authors examined the perception of time during social interactions and its relationship to social proficiency. I found the use of drug administration to be novel and a nice addition to the initial experiments. The methods and results were also clearly written and easy to understand. My main concerns surround the theoretical importance of these findings and the small sample sizes. In both the Introduction and Discussion section, it is unclear why it's important to perceive time accurately in social actions. The paper would be greatly improved if the reader understood more about the perception of time and the social consequences of the temporal compression effect. I didn't have any sense of how this would impact high AQ individuals in everyday life. Although it is clear that there is a temporal compression effect occurring, it is critical to provide more background and theoretical setup for the reader. For example, the authors state, "For instance, intense and/or moving stimuli are generally experienced as longer in duration (Fraisse, 1984) as they evoke stronger perceptual responses in cortical neurons." So, are people with high autism quotient experiencing stimuli as less intense? Or are socially proficient people more engaged by social stimuli and are therefore perceiving them as shorter in duration? What is the proposed mechanism? Related to the point above, it was unclear why oxytocin should be involved in temporal sequencing. Instead, the Introduction just points out that it should impact the perception of social stimuli & biological motion. This is somewhat vague, so it is also difficult to interpret what we learn from the observed effects of oxytocin. It would also be helpful to have more background about the development and validation of the stimuli. The noncommunicative motion sequences were created by cross-pairing the agents from different interactions. Did the authors confirm that these sequences were perceived as noncommunicative by the participants? This seems critical to confirm since the conclusions are based on this distinction. The sample sizes seem small for all studies. The authors should justify why they chose this sample size and demonstrate it has adequate power for detecting the effect. In addition, some samples had female and male participants, while others had only male participants. The authors should justify these decisions and gender as a covariate in their analyses. Lastly, it was unclear why there was no low AQ group for oxytocin administration in Experiment 5. This article takes a creative and thoughtful approach to testing if the social nature of observed actions, as well as the social proficiency of the perceiver, impact the subjective duration of those actions. Biological motion displays of two individuals were judged to be shorter when an intact communicative interaction was depicted, rather than when footage of individuals from two different interactions was combined into a single display of two individuals acting in parallel but independently from one another; these effects disappeared when the perception of a communicative interaction was interfered with via spatial and temporal manipulations of the stimuli. Additionally, the relative extent of the temporal compression effect for intact communicative displays was stronger among males with lower AQ scores, and the administration of oxytocin strengthened the effect, whereas an oxytocin agonist attenuated the temporal compression effect. The methods used are innovative and the research question is novel and likely to be of interest to a wide audience. My primary concern is that the "social" (i.e., intact communicative) displays differ from the various spatially and temporally perturbed variations that were tested, as well as from the non-communicative displays, not just because they depict intact social communication, but also because they depict coherent and contingent series of actions that are likely easier for participants to follow, predict and make sense of, compared with the non-communicative displays or the spatially or temporally disrupted displays. This would seem to be an alternative possible explanation for the temporal compression effects reported here. Would non-social motion displays, that depict the interactive, contingent movement of multiple entities/objects (e.g., a person interacting with a tool or object; Michotte-like ball launching stimuli; a stream of dominos falling) be judged as shorter in duration than comparable displays depicting the same entities moving entirely independently from one another? In other words, is the temporal compression effect observed here reflective of the social nature of the intact communicative displays or of these PL displays being relatively easier for participants to follow, predict and integrate into a single coherent action representation? This seems especially relevant, given that the authors note that the subjective perception of duration is thought to be related to ease of processing. In the absence of a non-social control condition testing for a temporal compression effect for non-social contingent vs. independent motion displays, it would be informative if the authors were to consider this possibility in more detail and discuss the need for future research using analogous non-social stimulus conditions. We appreciate your and the reviewers’ constructive suggestions and overall positive assessment of our work. We have now increased the sample sizes for Experiments 1-6 from ns = 12, 12, 12, 40, 24 and 12, to ns = 24, 24, 24, 50, 48 and 24, respectively, and have successfully replicated our original findings. The new data are now incorporated in the revised manuscript. Please also refer to our detailed response to reviewer 1’s point 1 below. This limitation is discussed on Discussion section of the revised manuscript. Please also refer to our detailed response to reviewer 3’s point 1 below. Please refer to our response to reviewer 1’s point 2 below. In brief, based on models of social perception and social inference (Anderson, 1981; Blythe, Todd, and Miller, 1999; Heider, 1944; Smith, 1984), the integration of signals is an integral part of social processing. It is plausible that deficits therein cascade into the domain of social interactions. However, our results were unlikely confounded by differences in the temporal integration of visual events per se. Stevenson et al., showed that people with autism had deficits in multisensory, but not unisensory (visual or auditory), temporal function (Stevenson et al., 2014), whereas our study employed only visual stimuli. Furthermore, we tested healthy young adults without autism, and the high AQ and low AQ participants did not differ in sensitivities of temporal perception. These are now discussed in the Discussion section of the revised manuscript. Along these lines, I would highlight the concerns that reviewer #2 raises concerning other possible factors that could mediate the effects of oxytocin. For example, oxytocin has been implicated in obsessive/repetitive/stereotyped behaviors (e.g., Leckman et al., 1994; McDougal et al., 1999; Insel et al., 1999; Hollander et al., 2003) as well as anxiety, which is one of the reasons some have hypothesized that oxytocin may be dysregulagted in autism, given that both oxytocin and autism have been linked with repetitive behaviors/rigidity and social impairments. It is possible that the effects of oxytocin observed here could be mediated by these other processes, which should be raised in the Discussion section. We have briefly discussed this possibility on Discussion section of the revised manuscript. The authors connect an impressively varied subject matter from biological motion, perception of time, autism, and oxytocin to support a very interesting hypothesis about temporal compression in perception. We thank the reviewer for his/her positive assessment of our work. 1) My primary concern is the small sample sizes which constrain confidence in the results. For this reason alone, I cannot recommend publication in eLife. I sincerely hope that the authors consider collecting a new, larger set of data, ideally after pre-registering the hypotheses and methods. I think the ideas and experimental designs are sufficiently interesting and innovative to make a strong contribution to the literature assuming well-powered empirical support. We would like to note that we measured full psychometric functions at seven levels of duration difference between communicative and noncommunicative motion sequences. In the original figures, each dot on a psychophysical curve represented the average of at least 240 data points (20 data points per subject × at least 12 subjects). The mean PSE, which was statistically tested, characterized the entire curve, namely at least 1680 data points. Psychophysical experiments of this type of design are sensitive in quantifying the relationship between physical stimuli and the perception they produce and do not typically require many subjects. For instance, a landmark study in the field of biological motion, which reported adaptation of gender derived from biological motion, had a total of 13 subjects, 7 in Experiment 1 and 6 in Experiment 2 (Jordan et al., 2006). Nonetheless, we agree with the reviewer that bolstering sample sizes would strengthen the study. We have since increased the sample sizes for Experiments 1-6 from ns = 12, 12, 12, 40, 24 and 12, to ns = 24, 24, 24, 50, 48 and 24, respectively, and have successfully replicated the original findings. The new data are now incorporated in the revised manuscript. 2) The spatial and temporal disruptions in the control stimuli not only disrupt the perception of communicative intentions but presumably also add a measure of perceptual complexity (e.g., a lack of integration of signals reduces the ability of subjects to engage in higher-order data reduction). This difference in complexity is not just about social vs. nonsocial; indeed, one can imagine doing the same to nonsocial displays in which a person is interacting contingently with another object. This is important because people with autism exhibit deficits in temporal integration of events over time more generally and so it is unclear which piece is critical here -- is it the social piece or is it the ability to form a cohesive integration of events (whether social or nonsocial)? See Stevenson et al., 2014 as an example of this more general deficit in people with ASD. We thank the reviewer for raising this thoughtful point. Social perception and social inference have long been theorized as processes of integration, including the integration between origin and effect (causal integration), the integration of information (e.g. motion cues) to form impressions, extract intentions, arrive at judgments (cognitive algebra), etc. (Anderson, 1981; Blythe et al., 1999; Heider, 1944; Smith, 1984). Even simple social perception like that of biological motion requires the integration between motion and form (Allison, Puce, and McCarthy, 2000), and people with autism show a deficit in biological motion perception (Blake et al., 2003). Hence, the integration of signals seems an integral part of social processing. It is plausible that deficits therein cascade into the domain of social interactions. As an aside, the perception of a person interacting with another object entails causal integration and the extraction of intentions and is arguably social in nature. With respect to temporal integration per se, Stevenson et al., showed that people with autism had deficits in multisensory, but not unisensory (visual or auditory), temporal function (Stevenson et al., 2014), whereas our study employed only visual stimuli. Furthermore, we tested healthy young adults without autism, and the high AQ and low AQ participants did not differ in sensitivities of temporal perception, as indicated by their difference limens (Experiment 4: t48 = -1.26, p = 0.21; Experiment 5-6: t70 = 0.21, p = 0.84). It is therefore unlikely that our results were confounded by differences in the integration of visual events over time. These are now incorporated in the Discussion section of the revised manuscript. We appreciate the reviewer’s positive assessment of our work. 1) As noted, I really like the diverse methodological approaches the authors used, and I think that this speaks to the robustness of the phenomenon in question. That having been said, the sample size for the drug administration studies was small, even considering the within-subject design used. Given increased concerns about replication in science, I wondered if the authors could speak to the robustness of the effects. Of course, one option is to collect more data; that said, I appreciate the difficulty and expense of this kind of research. As an alternative, perhaps the authors could use bootstrapping to obtain an estimate of the confidence intervals for the effects observed? In the absence of additional data, it would be reassuring to know that the estimated effect(s) ranged from, say, p=0.01 to p=0.12, and not p=0.01 to p=0.4. We appreciate the constructive suggestions. This point is similar to reviewer 1’s point 1. Please refer to our response to that point above. In brief, we have increased the sample sizes for Experiments 1-6 from ns = 12, 12, 12, 40, 24 and 12, to ns = 24, 24, 24, 50, 48 and 24, respectively, and have successfully replicated the original findings. The new data are now incorporated in the revised manuscript. 2) I had a few questions about the oxytocin agonist and antagonist used in this research. First, is "ProSpec" the drug manufacturer? I am not familiar with ProSpec and wondered if the authors could provide some additional information about ProSpec vis a vis quality control. We ordered oxytocin (>99.0% as determined by RP-HPLC) and atosiban (>99.0% as determined by RP-HPLC) from a local distributor for ProSpec (https://www.prospecbio.com), a biotech company based in Rehovot Israel that provides highly purified proteins. Second, I was not able to access the paper by Lundin et al. showing that atosiban can be administered nasally and, for this reason, thought it might be helpful if the authors could provide more details about Lundin et al's findings regarding the bioavailability of nasally administered atosiban in their paper. Lundin et al., found that after intranasal administration of atosiban (100 nmol/kg/body weight), the bioavailability was 10.5 +/- 2.9%. Peak concentrations in plasma appeared 10-45 min after intranasal administration. Moreover, at the end of an observation period of 2 h, measurable amounts in plasma were still found in seven of the twelve intranasal experiments (Lundin et al., 1986). See also (Lamont and Kam, 2008) for a review. Third, it would be helpful if the authors could give more information about the preparation of the atosiban-is this a commercially available product, or was it made by the researchers? We prepared the oxytocin and atosiban nasal sprays in the lab. Specifically, we dissolved oxytocin and atosiban, respectively, in saline, and stored the solutions in 10ml sterilized nasal spray bottles at 4 °C. Fresh solutions were made every 3 days during the period of data collection, such that for each participant in the drug administration experiments, the solution he received was made in less than 3 days before. What was the concentration of the active ingredient? The concentration of the atosiban solution was 80 μg/ml. 6 puffs of nasal spray contained approximately 0.75 ml of liquid and 60 μg of atosiban. See also our response to a related point (point 7) raised by reviewer 3 below. Do intranasal and IV formulations of atosiban differ and is this relevant for the present investigation? As mentioned in our response to this reviewer’s point 2, the atosiban nasal spray used in our study contained only atosiban and saline (60 μg/0.75 ml). The IV formulation of atosiban, Tractocile (https://www.medicines.org.uk/emc/medicine/4297), contains atosiban (as acetate, 6.75 mg/0.9ml), mannitol, hydrochloric acid 1M, and water. This difference is unlikely relevant for the present study, as the oxytocin and atosiban nasal sprays were prepared in the same manner. 3) In Experiments 5 and 6, the researchers preselected participants based on an AQ cutoff of > 20; how was this cutoff determined? I believe the "autism cutoff" on the AQ-adult is 32 (Baron-Cohen et al., 2001). I realize the researchers are not making the claim that their sample is actually on the autism spectrum and, therefore, would not need to use such a rigorous cutoff, but I'm just curious how they selected their cutoff. As mentioned in the Results section of the original manuscript, the median AQ score of the participants in Experiment 4 (all males) was 20, corresponding to a cut-off between low and intermediate levels of autistic traits (Baron-Cohen et al., 2001). A median split of these participants by AQ score showed that the social interaction induced temporal compression effect was evident in the low AQ group (AQ scores < 20), but not in the high AQ group (AQ scores ≥ 20), with a significant group difference in PSE. The AQ cutoff of 20 was subsequently adopted in Experiments 5 and 6. We have made this explicit in subsection “Oxytocin Mediates Temporal Perception of Social Interactions”of the revised manuscript. 4) The authors might consider spending some time discussing the meaning of the time compression effect in the introduction-that is, why it comes about and what it means. They address this in the discussion (i.e., that it likely reflects "the amount of energy expended in representing a stimulus") but, given the novelty of the phenomena, I think it would be helpful to readers to discuss this a bit in the introduction as well. Suggestion well taken. We have incorporated a brief description of the neural meaning of subjective time in the Introduction section of the revised manuscript. We appreciate the reviewer’s positive remarks. a) Generally, a placebo is used to control for the subject-expectancy effect. The current study employed a two-interval forced choice task where participants judged which of the two intervals appeared longer in duration. The nature of this task made it less susceptible to the influence of a general expectation that drug administration would produce a certain effect. b) The comparison between an oxytocin agonist (oxytocin) and an oxytocin antagonist (atosiban) speaks directly to the role of oxytocin in mediating subjective temporal perception of social interactions. Whereas we do not think that the lack of a placebo control compromises the validity of our findings, we agree with the reviewer that a placebo control would be helpful to determine the extent to which expectancies influence the observed results. This limitation is discussed in the Discussion section of the revised manuscript. Unfortunately, not in the context of this report. We did find that plasma oxytocin level negatively correlates with AQ score in a sample of 48 males unrelated to the current study, consistent with the documented associations between endogenous oxytocin levels and prosocial traits (Andari et al., 2014; Parker et al., 2014). As an aside, it has been argued that oxytocin is not a valid biomarker when measured in saliva by immunoassay (Horvat-Gordon et al., 2005). As mentioned above in our response to this reviewer’s point 2, data from our lab and others indicate that social traits have neuroendocrine origins. Since we did not assess endogenous oxytocin levels in the current study, we have changed the expression to “…personality traits, which likely have neuroendocrine origins as per previous research”. As the effect of intranasal oxytocin varied based on subjects’ blood oxytocin concentration (Parker et al., 2017) as well as social proficiency (Bartz, 2016; Bartz et al., 2010; Bartz et al., 2011; Olff et al., 2013), which in turn has been linked with endogenous oxytocin levels (Andari et al., 2014; Parker et al., 2014) (see also our response to this reviewer’s point 2), it can be inferred that exogenous oxytocin and endogenous oxytocin likely interact to modulate behavior. We have made this clear in the Introduction of the revised manuscript. Per your and reviewer 2’s suggestions, we have cited (Dal Monte et al., 2014; Freeman et al., 2016; Lee and Weerts, 2016; Striepens et al., 2013) instead of the Born et al. paper here, to show that intranasally administered oxytocin are centrally available. We thank the reviewer for pointing this out. We have since changed it to “…that antagonizing the effect of endogenous oxytocin…” in the Discussion section of the revised manuscript. Each subject participated in only one experiment, so there was no overlap in subjects tested across experiments. The participants in Experiments 5 and 6 performed the duration judgment task twice, once before and once after drug administration. This unlikely affected the reported results, as we were primarily interested in the comparison between drug conditions (oxytocin vs. atosiban). 7) Materials and methods section (drug application): What was the latency from drug (agonist and antagonist) administration to behavioral testing? As mentioned in subsection “Oxytocin Mediates Temporal Perception of Social Interactions” and subsection “Behavioral Procedures.” of the original manuscript, it was 40 minutes. How was the dose of atosiban determined? 24 IU (dose of oxytocin used in the current study and several other studies (e.g. (Bartz et al., 2010))) is the equivalent of about 48 μg oxytocin and 60 μg vasopressin. Atosiban is close to oxytocin and vasopressin in both structure and molar mass (994.2, 1007.2, and 1084.2 g/mol, respectively), yet the IU for atosiban has not been established. To be conservative, we used 60 μg atosiban. Were preliminary dose-response studies conducted to determine drug efficacy? Atosiban was primarily used as a comparison treatment for oxytocin to qualify the role of oxytocin in mediating subjective temporal perception of social interactions. Since previous studies have shown that intranasally administered atosiban is centrally available (Lamont and Kam, 2008; Lundin et al., 1986) (see also our response to reviewer 2’s point 2), we did not conduct dose-response studies to determine drug efficacy. 1) The lack of placebo group, especially in Experiment 6. While you argue that expectancy effects are likely not the cause of the observed results in Experiment 5, It would be useful to add discussion of why issues related to the lack of a placebo control group (beyond expectancy effects), such as practice effects or fatigue, would or would not impact the results in Studies 5 and 6. While we believe that this is less likely to be an issue for Experiment 5, given that half of the high AQ participants were given oxytocin and half were given atosiban, and the results were in opposite directions across groups (i.e., an increase in the PSE in the oxytocin group and a decrease in the atosiban group), it would be more compelling to report whether the changes in PSEs pre- and post-drug administration differed significantly between groups by comparing them directly. Between the two drug groups (oxytocin vs. atosiban) in Experiment 5, there was a marked difference in the changes in PSEs pre- and post- drug administration (t78 = 4.25, p < 0.001, Cohen’s d = 0.95). This is now incorporated in subsection “Oxytocin Mediates Temporal Perception of Social Interactions Autistic traits” of the revised main text. An additional question about Study 5 was whether the drugs were administered in a double-blind fashion. I wasn't sure if there was reference to this in the manuscript. Of course, it would be highly problematic if administration was not double blind. Yes. Neither the participants nor the experimenters were aware of the identity of the drug used. We have made it explicit in the revised Materials and methods section of the revised main text. Please refer to our responses to reviewer 1’s point 3 and reviewer 2’s point 6 below. In brief, we have included a placebo control (saline) group and tested additional atosiban participants in the revised Experiment 6. We found that, different from atosiban, the administration of saline did not significantly alter the observers’ PSEs (t39 = -1.13, p = 0.26). Moreover, between the two drug groups, there was a significant difference in the changes in PSEs pre- and post- drug administration (t78 = 2.22, p = 0.029, Cohen’s d = 0.50). We therefore concluded that the decreased temporal compression effect observed in the atosiban group was due to the administration of atosiban instead of potential confounds like practice or fatigue. In Experiments 1-3 (as well as the new supplementary experiment), the sample sizes of n = 24 per group were determined by G*Power to be sufficient to detect a large temporal distortion effect in time perception (d ≥ 0.8), at a power larger than 95%. The effect size was estimated based on an earlier study that employed biological motion stimuli and similar psychophysical testing procedures to those in the current study (Wang and Jiang, 2012). We note that studies on time perception have commonly obtained large effect sizes (d ≥ 0.8) (Droit-Volet et al., 2010; Frassinetti, Magnani and Oliveri, 2009; Hagura et al., 2012; Matthews, 2015; Sadeghi et al., 2011; Zhou et al., 2014). For Experiments 4-6, we have increased the sample sizes from ns = 50, 48 and 24 to ns = 90, 80 and 80 (40 participants per group), and have replicated and strengthened the original findings. Please refer to our responses to reviewer 1’s points 1 and 2 and reviewer 2’s point 4 below for details. Please refer to our response to reviewer 3’s point 1 below. In brief, we have carried out a supplementary experiment using Michotte-like launching and streaming events (Michotte, 1963). In sharp contrast to the temporal compression effect observed in Experiment 1, we obtained a strong temporal dilation effect (t23 = -5.78, p < 0.001, Cohen’s d = -1.2). A “causal” launching event was judged to be of significantly longer duration than a “noncausal” streaming event such that it needed to be 105.8 ms shorter to be perceived as equal in duration to the latter. We thus concluded that the inference of causality, or the contingency between the movements of two entities, is unlikely to account for the temporal compression effect associated with the perception of social interactions. We thank the reviewer for the commendation. 1) I was curious how the authors decided what an appropriate sample size would be for each study-was a power analysis conducted? If so, that should be reported. The sample sizes of n = 24 per group were determined by G*Power to be sufficient to detect a large temporal distortion effect in time perception (d ≥ 0.8), at a power larger than 95%. The effect size was estimated based on an earlier study that employed biological motion stimuli and similar psychophysical testing procedures to those in the current study (Wang and Jiang, 2012). This is now incorporated in the Materials and methods section of the revised main text. We also note that studies on time perception have commonly obtained large effect sizes (d ≥ 0.8) (Droit-Volet et al., 2010; Frassinetti et al., 2009; Hagura et al., 2012; Matthews, 2015; Sadeghi et al., 2011; Zhou et al., 2014). 2) I appreciate the authors' point that establishing the time compression effect does not require a large number of participants because, as they note in response to reviewer 1 – point 1, each participant has a very large number of data points. However, studies 4, 5, and 6 still seem a bit small to me. It is known that the effects of oxytocin (and possibly atosiban) can be person-dependent and, for this reason, small samples are discouraged as the effects could be driven by, e.g., idiosyncrasies in the way some people respond to oxytocin. My impression is that most intranasal oxytocin studies that are published now have at least 40-50 ps/cell for between-subject designs and 30 ps for within-subject designs; with 12 and 24 participants, studies 5 and 6 still seem small to me. Of course, if a power analysis suggests otherwise that would be useful information to know. (Also, the effects are consistent with other work on oxytocin and social cognition so reassuring on that front). As mentioned above in our response to this reviewer’s point 1, our power analysis was based on previous studies on time perception. We feel that grouping the participants by their AQ scores likely limits the within-group variance in the effects of oxytocin and atosiban (Bartz, 2016; Bartz et al., 2010; Bartz et al., 2011; Olff et al., 2013). That said, we are unaware of any intranasal oxytocin/atosiban study that has examined time perception with a similar paradigm to that used in the current study. We have thus followed the reviewer’s suggestion and increased the sample sizes of Experiments 5 and 6 from ns = 48 and 24 to ns = 80 and 80 (i.e. from ns = 24 per group to ns = 40 per group, see also our response to this reviewer’s point 3 below), respectively, and have successfully replicated the original findings. The new data are now incorporated in the revised manuscript. The sample size of study 4 also seems a bit small for evaluating the correlation between two variables (e.g., see Lindsay, 2015)-I don't think the authors need a sample as large as 250 (cf. Schönbrodt and Perugini, 2013), since the effect is consistent with prior work linking AQ with indices of social cognitive proficiency, but some justification for the sample size seems necessary given current norms. Experiment 4 set out to qualify if the extent of temporal compression induced by the perception of social interactions was related to one’s social proficiency. The goal was not to achieve a stable estimate for the true correlation value ρ, which is the issue dealt with in Schönbrodt and Perugini’s paper (Schönbrodt and Perugini, 2013). Nonetheless, we have increased the sample size from n = 50 to n = 90 and obtained a highly significant correlation, r90 = -0.40, p < 0.001. The new data are now incorporated into the Results section of the revised main text. 3) In the previous round of reviews concerns were raised about the lack of a placebo control. The authors acknowledged this limitation but argue that expectancy effects were unlikely with the task they used. I agree but note that expectancy effects are not the only reason why a placebo control is useful; other reasons to have a placebo control are to address such confounds as practice effects or fatigue. Is it possible that either of these factors could be driving the effects in studies 5 and/or 6? We have now included a placebo control group in Experiment 6, where the observers (n = 40, with AQ scores < 20) similarly completed the duration judgment task twice, once before and once 40 minutes after they self-administered 3 puffs of saline per nostril. At baseline, the observers were significantly biased towards perceiving the communicative motion sequences as shorter in duration than the noncommunicative ones (t39 = 5.94, p < 0.001, Cohen’s d = 0.94). They remained so after saline administration (t39 = 6.66, p < 0.001, Cohen’s d = 1.05), and showed no significant change in PSE (54.5 ms vs. 46.8 ms, t39 = -1.13, p = 0.26) (Figure 4D). By contrast, in those treated with atosiban, the mean PSE dropped significantly by 31.1 ms (t39 = -3.90, p < 0.001, Cohen’s d = -0.62). Between the two drug groups, there was a significant difference in the changes in PSEs pre- and post- drug administration (t78 = 2.22, p = 0.029, Cohen’s d = 0.50). We thus concluded that the observed effects of oxytocin and atosiban in Experiments 5 and 6 were unlikely driven by confounds like practice or fatigue. The results of the revised Experiment 6 are described in detail in subsection “Oxytocin Mediates Temporal Perception of Social Interactions” of the revised main text. We tested healthy young adults and found that the perception of social interactions induced a robust temporal compression effect, particularly in low AQ individuals, and that the extent of the effect reflected one’s social proficiency, a stable personality trait (Experiments 4-6). It is plausible that the lack of this effect partially contributes to the social behaviors manifested by socially less proficient individuals. For instance, they may not enjoy social chitchat as much. That said, we do not feel it causes adverse consequences for these individuals in everyday life on top of their relative lack of social proficiency. Exactly how time perception of social interactions affects one’s social behavior goes beyond the scope of the current study. As discussed in the Materials and methods section of the original main text, multiple brain regions are engaged in social perception, and coordinately enable efficient assessment and interpretation of social signals. They include not only the superior temporal sulcus (STS) that supports the understanding of actions (Allison, Puce and McCarthy, 2000), but also higher cortical areas like the temporal-parietal junction (TPJ) that represents mental states (Carter and Huettel, 2013) and the dorsal medial prefrontal cortex (dmPFC) that is implicated in the uniquely human representation of triadic interactions between two minds and an object (Saxe, 2006). The observed temporal compression effect, being independent of the perception of biological motion, likely arises from these higher stages of social processing (Cusack, Williams and Neri, 2015; von der Luhe et al., 2016). Subjective time has been proposed to be a signature of the amount of energy expended in representing a stimulus (Eagleman and Pariyadath, 2009). It is plausible that communicative motion sequences are processed with increased efficiency in TPJ and dmPFC relative to motion sequences without a recognizable communicative intention, thus leading to lowered metabolic cost (Gutnisky and Dragoi, 2008; Laughlin, 2001) and shortened subjective duration, particularly in socially proficient individuals. We have now explicitly stated at the end of the revised Introduction that our hypothesis was that social proficiency would influence the neural efficacy in processing social interactions, and thereby modulate the subjective time of perceived social interactions. We hypothesized that exogenous manipulations of oxytocin level would alter the neural efficacy in processing social interactions, and thereby modulate the subjective time of perceived social interactions. We have now made it explicit in the revised Introduction of the revised main text. As discussed in detail the Discussion section of the original main text, oxytocin has increasingly been identified as an important modulator of social behaviors (Carter, 2014; Donaldson and Young, 2008). Results from human brain imaging studies indicate that the application of oxytocin modulates responses in the STS, TPJ and the prefrontal cortex, among others, in various social cognitive tasks (Zink and Meyer-Lindenberg, 2012). Such alterations of neural activities presumably facilitate social processing in socially less proficient individuals, where exogenous oxytocin has been shown to exert a more definitive prosocial effect (Bartz et al., 2010; Bartz et al., 2011), thereby giving rise to their shortened subjective duration of social interactions following oxytocin administration. An independent group of 24 observers (half male) rated the communicativeness of each of the 20 motion sequences (the original communicative ones and the noncommunicative ones, shown upright) on a visual analogue scale. The noncommunicative motion sequences were perceived to be significantly less communicative than the communicative ones (normalized communicativeness rating: 0.37 vs. 0.71, t23 = -8.11, p < 0.0001, Cohen’s d = -1.66). This is now incorporated in the Materials and methods section of the revised main text. The sample sizes seem small for all studies. The authors should justify why they chose this sample size and demonstrate it has adequate power for detecting the effect. This point is similar to Reviewer 1’s Points 1 and 2. Please refer to our responses to those points above. In brief, the sample sizes of n = 24 per group (Experiments 1-3 as well as the new supplementary experiment) were determined by G*Power to be sufficient to detect a large temporal distortion effect in time perception (d ≥ 0.8), at a power larger than 95%. The effect size was estimated based on an earlier study that employed biological motion stimuli and similar psychophysical testing procedures to those in the current study (Wang & Jiang, 2012). We have since increased the sample sizes of Experiments 4-6 from ns = 50, 48 and 24 to ns = 90, 80 and 80, and have replicated and strengthened the original findings. The new data are now incorporated in the revised manuscript. In addition, some samples had female and male participants, while others had only male participants. The authors should justify these decisions and gender as a covariate in their analyses. Both male and female participants were recruited in Experiments 1-3 (as well as the supplementary experiment) to establish the temporal compression effect associated with the perception of social interactions. We did not use gender as a covariate in our analyses. Only males were recruited in Experiments 4-6. This was done in Experiment 4 to take advantage of the pronounced variance of social proficiency in males (Baron-Cohen et al., 2001), so as to probe whether social proficiency correlates with the extent of temporal compression induced by the perception of social interactions. Experiments 5 and 6 tested only males for pragmatic reasons (like most intranasal oxytocin studies), as oxytocin and atosiban respectively cause and antagonize contractions of the uterus. These are now clarified in the Materials and methods section of the revised main text. Lastly, it was unclear why there was no low AQ group for oxytocin administration in Experiment 5. It has been shown that the effects of exogenous oxytocin are more complicated in socially proficient individuals, even hard to predict and interpret (Bartz, 2016; Bartz et al., 2010; Bartz et al., 2011; Olff et al., 2013)(p. 21 of the original main text). We therefore did not include a low AQ group for oxytocin administration. Instead, we have followed the editor’s and reviewer 1’s suggestions and included a placebo control (saline) group in the revised Experiment 6 (low AQ individuals). Please refer to our responses to the editor’s point 1 and reviewer 1’s point 3 for details. We thank the reviewer for raising this thoughtful point. We have followed the reviewer’s suggestion and carried out a supplementary experiment using Michotte-like launching and streaming events (Michotte, 1963). In sharp contrast to the temporal compression effect observed in Experiment 1, we obtained a strong temporal dilation effect (t23 = -5.78, p < 0.001, Cohen’s d = -1.2). A “causal” launching event needed to be 105.8 ms shorter to be perceived as equal in duration to a “noncausal” streaming event. We therefore concluded that the inference of causality, or the contingency between the movements of two entities, is unlikely to account for the temporal compression effect associated with the perception of social interactions. The supplementary experiment is mentioned in the Results section and the Discussion section of the revised main text and is illustrated and described in Figure 2—figure supplement 1 and its legend. We thank Yuting Ye for assistance, and Zhi Yang and Qian Xu for comments and suggestions. This work was supported by the National Natural Science Foundation of China (31422023 and 31525011), the Strategic Priority Research Program (XDB02010003 and XDB02030006) and the Key Research Program of Frontier Sciences (QYZDB-SSW-SMC030 and QYZDB-SSW-SMC055) of the Chinese Academy of Sciences. © 2018, Liu et al.